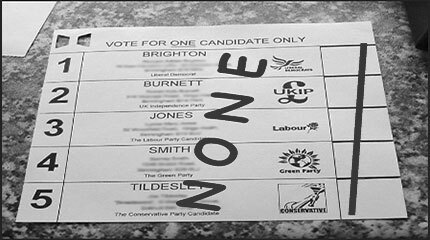 VoteOrVoteNone is a positive campaign to convince everyone in the UK to participate in elections, either by Voting, or by Voting None. The message is to the 'Unheard Third' of registered voters is 'There's no reason to be silent'. ● 'Why be silent?' summarises the core message of the campaign to the 16m potential non-voters. ● 'Aims + Summary' sets out the 4 campaign aims, and the key messages to voters, politicians, the Electoral Commission and the BBC. ● 'Making Protest Votes Count' explains why protest votes need to be clear, to establish the protest vote as a healthy barometer of political dissent, rather than just 'spoilt ballots'. ● 'About' includes quotations from personal experience. ● 'Election Video' includes live tweets. Please quote accurately from the site, and link to it. Contact us if you have queries or are interested in an interview. This project is unfunded, so please consider a donation.